Cambodia is much like India, with motorbikes on the road and the need to haggle with anyone you’re paying. The country seems quite laid back-restaurants and tourist spots close at random times. There are people hanging out in the streets talking to each other. The city is fairly low rise giving me the impression of a small town or rather a city like kyoto. The appearance of cambodian people is quite unique and striking to me. They come off as a mixture of Chinese and Indonesian people. The locals are generally friendly and helpful, but their constant efforts to rip off money from tourists makes me feel like a complete outsider. We flew into the Phnom Penh airport, which is surprisingly close to the city. Options for transport included taxis and tuk tuks. Tuks tuks, much like the auto rickshaws in India, cost half the price of taxis (even though the tuk tuk drivers cite double the price to foreigners). Although we managed to bring down the price of our ride to $5, we later discovered that tuk tuk drivers are generally paid a flat rate of $3 per ride. A lot of trade here takes place in USD. Although Florence and I converted our Singapore dollars to the local currency, we found restaurants and tuk tuk drivers citing their prices in dollars and accepting USD notes. It took us a while to get to our hotel, mostly because we got lost and the tuk tuk driver wasn’t sure of the location of our hotel either. We noticed that the streets here are pretty badly organised. The numbers of streets aren’t in chronological order and we ended up at the wrong hotel of a similar name, from where we had to take another tuk tuk. The upside of it was that we got to see much of the city during the ride. We saw a lot of universities and exotic buildings. The architecture is very impressive and archaic. 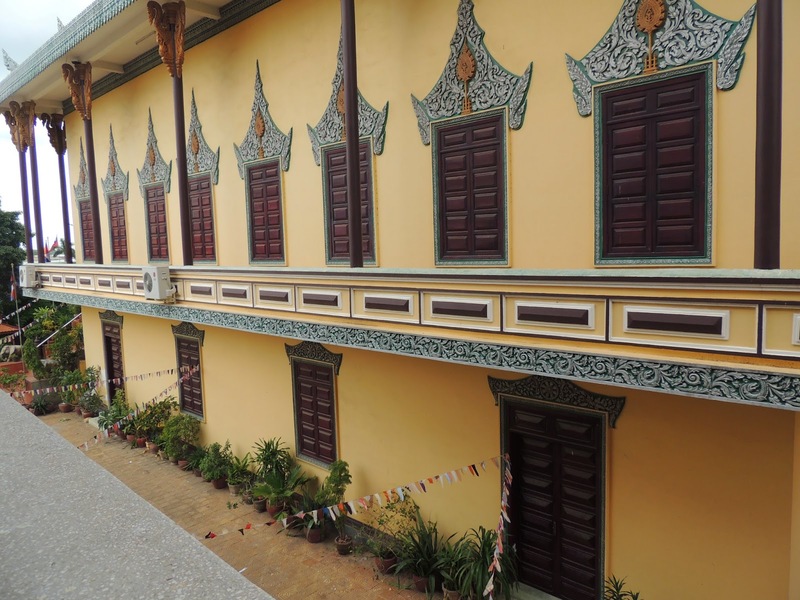 Lot of government offices, museums and universities appear lavish with pagodas, colorful walls and golden decor. The streets weren’t very crowded, but we heard that there’s country wide festival going on at the moment which is why much of the trade and commerce is closed for the next two days. By the time we got to the hotel, we were tired of tuk tuk drivers on the roads asking us if we needed a ride or a tour around the city. We were already primed to not trust people and found ourselves bargaining with the hotel manager. The location of our hotel is quite nice. It is near the river side and the royal palace (which is where the king lives) , but the street it is in is quite isolated and quiet. So we get the best of both worlds. For lunch, we went to the riverside where there are many restaurants. Much of the food here is vietnamese and thai. The local food, called khmer food, is also available but we didn’t come across a single purely khmer restaurant at the riverside. Most restaurants are pretty cheap, even by the riverside and meals are easily under $5 per person. For lunch, we ate mango salad and glass noodle salad. Later, we visited a pagoda, the Russian market and the New Market. The Russian market seemed like any other local market selling clothes. Some were branded shops, others were roadside hawkers. None of the brands were multinationals, interestingly enough. 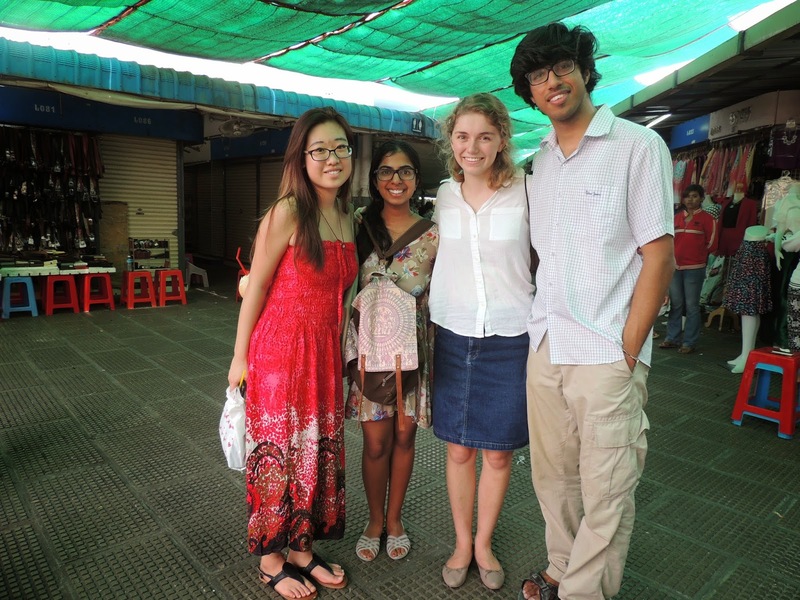 We spent a few minutes there and then moved on to the new market. The New Market was much nicer in that it was livelier and had a bigger variety of things. There were fruits, coconuts, clothes, souvenirs, etc. There are more tourists here than I expected, but not half as many as I saw in Penang or Japan. Phnom Penh is cleaner than I imagined. Although I’ve heard a lot about poverty in Cambodia, I haven’t yet seen much of it. I’ve seen a few beggars on the street and some children selling cheap trinkets, but I know for a fact that I’m in a well off area of Phnom Penh which is probably one of the richest and poshest places in the whole of Cambodia. By this time, we were tired from the heat (it’s quite hot here) and the lack of sleep. Although it was only 3 pm, we had already had a 12 hour day and went back to our hotel for a nap. We managed to catch a glimpse of the independence monument and the the grand residence of the prime minister and the government on the way back. Later, we went to a restaurant near the riverside and got some delicious and cheap vietnamese pho for dinner. 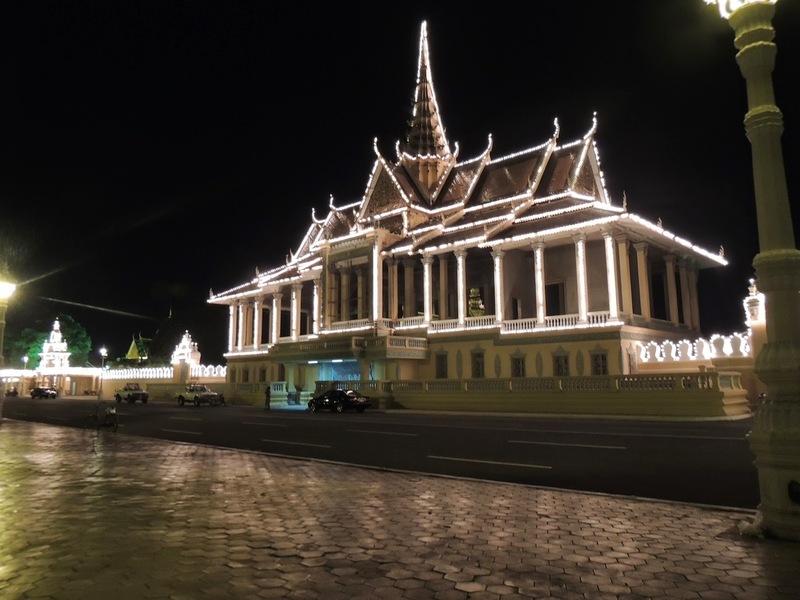 On the way back, we walked past the lit up royal palace. I’m not sure if it was lit up for the festive season or if its lit up every night, but either way it was beautiful.